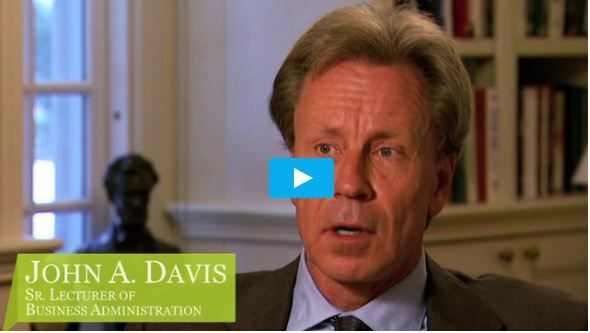 Watch Professor John Davis of Harvard Business School talk about challenges & trends facing business families. As new trends emerge in the market, it is essential for family business to be able to recognize these trends and be able to adapt to these changes. Society has changed quite a bit in thirty years, and they are changing everywhere, even in the more traditional societies. In terms of trends, I do see this increasing sense of freedom in families that is good to some extent but also leads to a sense of fragmentation in the family’s purpose, and energy, and discipline. So there are some things that I think need to be reversed or strengthened in a number of families. When you think about it, you know, parents even thirty years ago, certainly forty or fifty, had more influence in their children’s lives, on who one of their children married, how they lived, what career they would choose, and that is not the case today. I think parents need to be more demanding of their children, they need to be stricter about the obligations of family members. They need to obviously support their children to find their own path and to lead happy lives and you cannot chain a family member to the business either as an employee or an owner, that is very harmful. It is better to give them their freedom if that is not what they truly want or are not capable. But you have the right to expect things from children. Commerce is becoming much more globalized now. We are thinking about how becoming more international in commerce is affecting the business. How are family businesses responding to that trend? And then also how are the families responding to that trend? Businesses are becoming more international. They are selling, sourcing, doing deals across national borders in different configurations, even small ones now. Many families now are becoming much more geographically disbursed, you know, within their own home country or across national borders, or even jeez, you know, cross-continents. They have become multi-cultural, multi-lingual, and there are some advantages to that, but it takes, you have to step up your management, your social engineering of the family in order to keep that kind of a family tight. Industry life cycles are shortening, we know that. The rate of change in business is accelerating. In any ten-year period, that is my rule now, you are going to make at least two important changes to your company. Some people are really good at reinventing their companies and changing things that they put in place, but if you put it in place and then you have to say, “Well that is no longer working, let us do something else,” I think that is pretty challenging. We may need to make more frequent transitions of leadership in order to keep organizations continuing to regenerate. So there is one question, how long can people stay in office in the role of CEO and continue to go through those transformations? Thirty years? Well that is how long CEOs of family companies are around often, on average, twenty-five to thirty years. That is a long time. People are living longer. If the leader lives longer, will he or she stay in office longer or kind of check out at the late fifties? I want to figure this out, because it could be if leaders stay longer in the company that it is going to stall out the next generation even more than they are currently stalled out and sandwich the middle generation between two others, and you are going to end up with three generations working in a family business not two. And it is hard to tell a business leader that, who is very good at what he does, that it is time to step down. I think probably what we are going to see more on the business side is family leaders working their way up running the company for a while, handing it off to a family or non-family next CEO and remaining chairman to provide more stability at the board level.